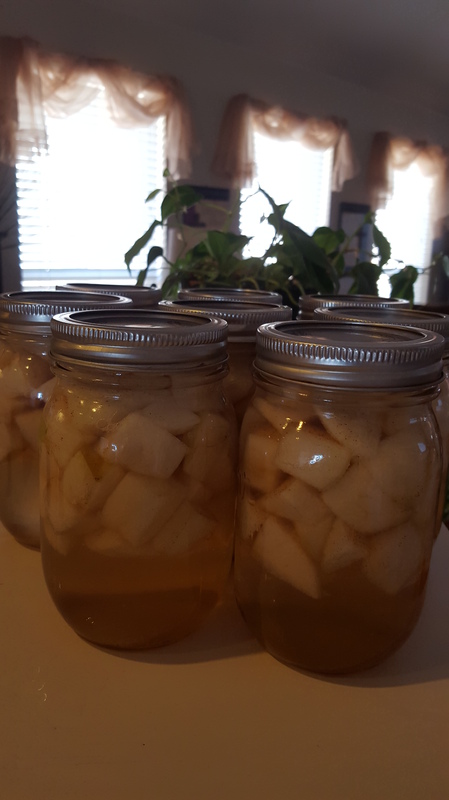 I canned the remaining apples I had. I had found a great daily on honeycrisp apples. Find how here. This recipe was so easy also doesn’t require a pressure canner. Just a really deep pot taller than your jars. I used pint jars and this recipe filled 8 pints. Prepare your diced apples by peeling and coring your them. Cut them in to chunky pieces and soak in lemon water until they are all cut up. In a medium sauce pan, combine water, sugar, cinnamon, clove, and salt. Bring mixture to simmer for 5 minutes until sugar is completely dissolved. 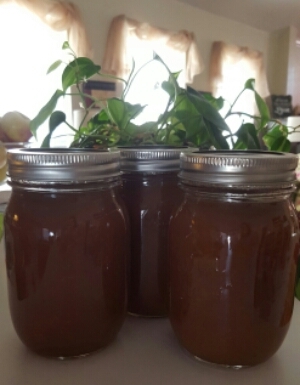 Sterilize your jars and fill with drained apples packing them down slightly. Fill one inch below the rim. Pour syrup over the apples also one inch below the rim. Put the lids on your jars, wipe the rims, and process in boiling water for 30 minutes. Make sure the water covers the jars by one inch. They look so yummy. I didn’t follow recipes necessarily because a lot said to cook the apples until soft. Well, I don’t know about you but I don’t like mushy apples to only cook or bake with them later and turn them even more mushy. I wanted versatility and decided to not cook them. This way, I get apples with some substance to them later on. This allows me to use them anyway I choose such as applesauce, syrup, pie filling, or use them diced in recipes. Total cost to make 13 pints of maple apple jam, diced apples, and apple butter was about .40 cents per jar including tax. The apples were the only cost and that was because I scored a big deal. Pay attention to food sales that are not advertised. You may score big! Read more about canning here. If they were honeycrisp or Gala apples I was definately buying. Especially honeycrisp because most often I see them for more than $3-4/lb. Now being from New England I know my apples and I’m extremely picky. They had red delicious and honeycrisp so I loaded up three bag fulls of honeycrisp apples which came to about 25lbs for $5 total! I decided to make yummy apple butter. I ended up getting 3 full pints of apple butter when canned. Prepare the apples by washing, coring, and cutting them into chunks. Leave the skin on because there are some vitamins/natural pectin in the skin and you are going to puree this anyway. Have a large bowl on the side filled half with water and 2 tsp lemon juice to keep the apples from turning brown until they are all cut up. 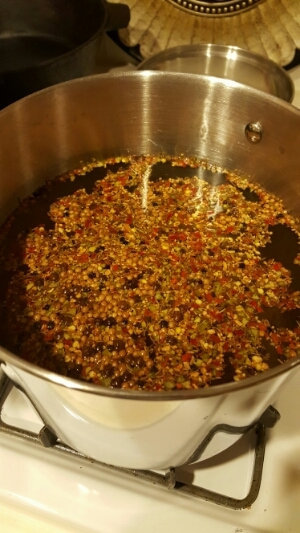 In a pot, mix water and spices until thoroughly mixed. Bring to a simmer and and add the apple chunks. Simmer for 30 minutes or until apples start to break down. 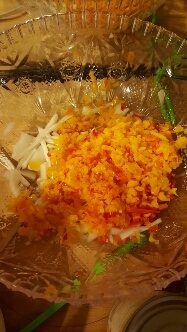 Stir your mixture and find the whole cloves. This isn’t hard and took just a few minutes. I used 10 and then fished out 10. You dont want to eat these but the flavor is intense. Using a food processor or a blender, puree your mixture and pour back in the pot to reduce. Add 2 cups of sugar. This will make your mixture a little runny but your going to reduce it until it’s thick and creamy like. About another 20-30 minutes. The mixture will be a dark brown, thick like a sauce but with applesauce consistency. Once reduced to the thickness that you want, add apple cider vinegar and salt to further enhance the flavor of your apples. It’s like a flavor boost and so delicious. Then you’re ready to can. With a funnel or very carefully pour the apple butter in your jars and leave 1 inch headspace. Headspace is a term they use for leave an inch from the top of the jar from the liquid. Using a knife or chopstick like object poke inside your jar. This will get out any air bubbles and prevent nasty stuff from growing. Wipe the edge of your jar with a damp rag to remove drips and moisture. Grab your lid which you soaked in boiling hot water and secure with the ring. 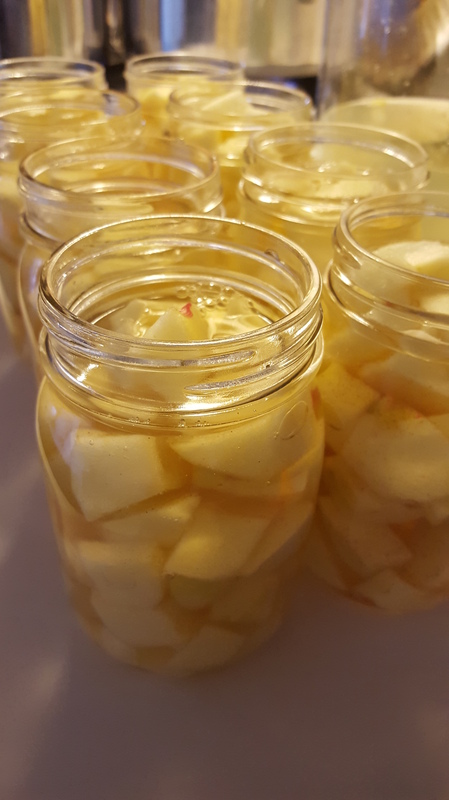 Canning your apples is super easy because it’s done in a water bath not a pressure canner. So anyone can do this. Fill a deep pot 3/4 with water or enough to cover your jars once inserted. The water must cover the jars by at least 1 inch. Bring to a rolling boil and add your jars. My mixture made 3 pint jars. Process for 10 minutes. That’s it! Within the first 5 minutes of your jars cooling on your counter they will pop! These do not store for a very long time like other foods. They will keep canned for up to a year. Apple butter is not a dairy product but more like a condiment like jelly. I used no pectin and no preservatives. If you’re using tart apples be sure to increase the amount of sugar. Enjoy! Today I decided to make homemade sweet habanero salsa from scratch. Since I am now the proud owner of a pressure canner, I can use it to water bath can too. Salsa is highly acidic so I can’t pressure can it. It will crack the jars and potentially break. So water bath canning it is! Dice everything rather small and bring to a simmer on medium heat until thickened and the flavors develop. 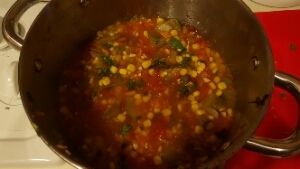 I added my corn in with an extra 1/4 tsp diced fresh cilantro just before canning. With a funnel or very carefully pour the hot salsa in your jars and leave 1 inch headspace. Headspace is a term they use for leave an inch from the top of the jar from the liquid. Using a knife or chopstick like object poke inside your jar. This will get out any air bubbles and prevent nasty stuff from growing. Wipe the edge of your jar with a damp rag to remove drips and moisture. Grab your lid which you soaked in boiling hot water and secure with the ring. Bring canner or large deep pot to a process in 2-3 inches of water at the bottom of your canner. Place jars in the pot on top of a metal rack so your jars dont break, and bring to a rolling boil, then simmer 15 minutes to process. After processing, carefully take out of the canner and let cool overnight or for 12 hours. This allows the contents to cool, vacuum seal to take place, and you will start hearing little popping sounds. That sound is like magic!! Now they will last you for many years if you dont use them right away. And you my friends have the sweetest homemade salsa with a kick of habanero pepper. Fantastic for dips or making salsa chicken in your crockpot. If you want spicier add more habanero. 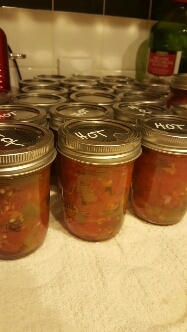 I had ingredients leftover from shopping so I made a double batch and the second time I added 8 habanero peppers. Mind you this is a whole pot. Using 2 habanero as the recipe above states only gives a mild version of heat. It will not make you cough or eyes water like some hot salsas do. But babydoll loves spice, so spice he gets! The above batch made 6-7 pint jars. I finally got my jars and tools I will need to start my canning and on top of that Walmart had inexpensive .88 cent bake sheets, cake pans, loaf pans, and a pizza pan. Guess who has all? With my new mixer and canner….I’d say I’m good. 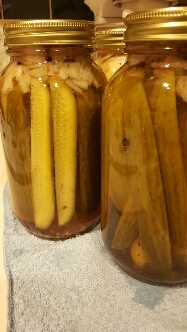 I canned spicy pickles tonight! They look so yummy I can’t wait to try them. Thank goodness for the YouTube videos I watch religiously because this is so intimidating. Here’s the recipe I used. To make your brine bring all ingredients to a boil for 15 minutes. To prepare you will need to sterilize your jars. Then fill them with quartered pickling cucumbers as well as the diced onions, and pack tight. 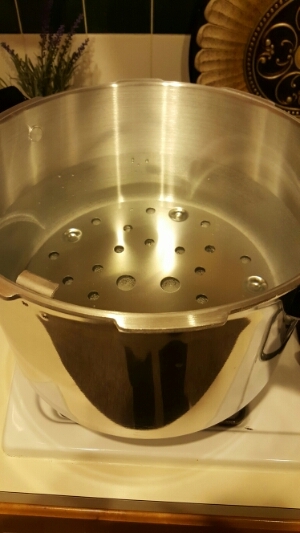 In a small pot, bring water to a boil and drop in your lids and metal rings to sterilize them. Turn the heat off and let them sit. 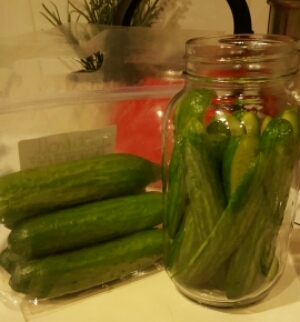 With a funnel or very carefully pour the hot brine over cucumbers and leave 1 inch headspace. Headspace is a term they use for leave an inch from the top of the jar from the liquid. Using a knife or chopstick like object poke inside your jar. This will get out any air bubbles and prevent nasty stuff from growing. Wipe the edge of your jar with a damp rag to remove drips and moisture. Grab your lid which you soaked in boiling hot water and secure with the ring. 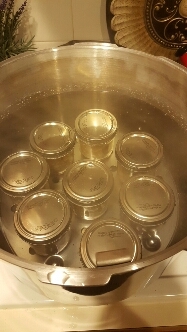 Bring canner or large deep pot to a boil, place jars in the pot on top of a metal rack so your jars dont break, and bring to a rolling boil, then simmer 15 minutes to process. Processing means the water is heating inside and outside of the jar hot enough and long enough to kill off bacteria, fungus, etc. After the jars have processed for 15 minutes, take them out carefully or use the jar tongs they sell in the canning section. Let them sit on the counter for 12 hours to cool. Timing is everything and depends on your elevation above sea level as well as acidity of your food and the type of food. They make special books that take the guesswork completely out of canning. It’s much much easier than it looks and YouTube is a wealth of knowledge on doing it. This is my first time and honestly I had fun!